A sequence is a function with a domain consisting of the natural numbers. A series is the sum of the terms of a sequence. (C) an infinite series of numbers. (B) 2, 4, 6, . . . , 20 is a finite sequence of numbers with t1 = 2, t2 = 4, t3 = 6, . . . , t10 = 20. (C) is an infinite series of numbers. 2. If , find the first five terms of the sequence. When 1, 2, 3, 4, and 5 are substituted for n , , and . The first five terms are . 3. 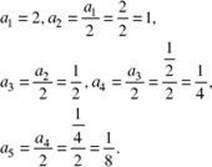 If a1 = 2 and , find the first five terms of the sequence. Since every term is expressed with respect to the immediately preceding term, this is called a recursion formula, and the resulting sequence is called a recursive sequence. Therefore, the first five terms are . Each term is half of its predecessor. 4. If a1 = 3 and an = 2an – 1 + 5, find a4. Put (or a1) into your graphing calculator, and press ENTER. Then multiply by 2 and add 5. Hit ENTER 3 more times to get a4 = 59. 5. If a1 = 1, a2 = 1, and an = an – 1 + an – 2for , find the first 7 terms of the sequence. The recursive formula indicates that each term is the sum of the two terms before it. Therefore, the first seven terms of this sequence are 1, 1, 2, 3, 5, 8, 13. This is called the Fibonacci sequence. A series can be abbreviated by using the Greek letter sigma, , to represent the summation of several terms. 6. (A) Express the series 2 + 4 + 6 + · · · + 20 in sigma notation. (B) = 02 + 12 + 22 + 32 + 42 + 52 = 0 + 1 + 4 + 9 + 16 + 25 = 55.